Chiang Mai takes breakfast seriously. Artisan coffee and bagels. French toast with candied bacon and pecans. Breakfast pizza with grilled peppers, bacon, mozzarella, egg, parmesan and rocket. Eggs Benedict with creamy homemade sauce. Fresh tropical fruit, natural yogurt and local honey. British sausages, hash browns, and baked beans. Yep, breakfast in Chiang Mai is special. And the best part? You can get breakfast til the sun goes down thanks to Chiang Mai's love of the sabai sabai slow life. 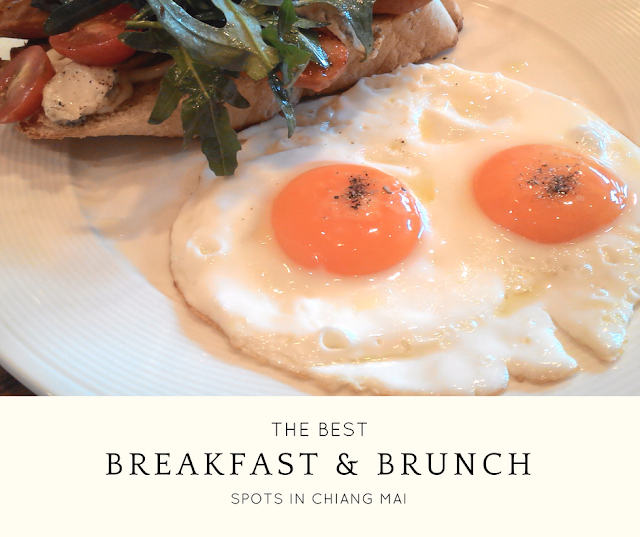 Here are the best breakfast and brunch spots I've found in Chiang Mai after spending many years here. They're not in any order, and they're all airconditioned and have WiFi unless stated. ONLY food that makes me say "Oh, wow!" is on this list. 'OK' breakfasts and mediocre brunches are banned. The Larder has a chill, laid-back vibe no matter how full it gets, and the gorgeous interior is as bright, vibrant, and fresh as the creative menu. Fluffy french toast served with berries, tropical fruit and thick vanilla cream, chorizo hot dogs topped with rocket and sharp gorgonzola cheese, avocado toast with tomatoes, rocket, olives and eggs, and the quality is as top-notch as the presentation. Sunlight streams in through big windows and lights up the place, and all the happy faces inside, beautifully. The staff are professional, attentive, and themselves - tattoos, badass fashion, dyed hair. Definitely a must-try in Chiang Mai. Recommended dishes: French toast, breakfast hotdog. Location: Just off Nimmanhaemin Road, here. Opening times: 08:30 - 15:00, closed Tues and Wed. Located on a quiet, leafy soi in the cultural Old City, Overstand has won awards for its generously portioned, fancy Western-style breakfasts and smooth, flavourful coffee. The interior is simple and homely with a calm-yet-upbeat vibe, the perfect setting for that feeling of the whole day stretching out in front of you. Menu items include grilled veggie salad with feta cheese, a Cuban sandwich with sourdough bread, brown sugar ham, pulled pork, pickles, cheddar cheese, spicy mustard, lettuce, tomato, radish and feta, and homemade olive tapenade spread on sourdough topped with fried eggs,parmesan, shallots & tomatoes. Beautifully presented and always tasty. Location: In the Old City near Thapae Gate, here. Nana Bakery is a bit of an in-the-know secret. Maybe I shouldn't tell, but this is too good not to share and I want them to enjoy all the success they can. Nana's bakers make delicious, as-authentic-as-it-gets, and amazingly cheap French baguettes, croissants, danishes, sourdough, quiche and more. The French baguette is even made using flour imported from France. There are four places to get your hands on Nana Bakery deliciousness. The most exciting one, Nana Jungle is a morning out in itself. Every Saturday morning freshly baked goods are laid out in bright yellow baskets in a jungle clearing next to an old temple. You grab a few brown paper bags, fill 'em up, and pay for them before grabbing a free coffee and finding a spot to sit. It's a very social event and you'll probably meet people. You can also get smoothies made in a blender powered by a stationary bicycle, homemade yogurt, flakey curry- or jam-filled puffs, Northern Thai food, and local clothes. You have to get there EARLY, we're talking before 8a.m, or you risk everything being gone already. The other Nana Bakery branches sell exactly the same products and are geared mostly for takeaway, but the Santitham and Nong Hoy branches serve coffee and have a few tables too. Santitham is the most convenient location if you're staying in the Old City or Nimmanhaemin areas. This is the cheapest option for Western breakfast food on this list. Location: Four locations: (1) Santitham, between Nimmanhaemin and the Old City, (2) Chang Khian off the Moat Road, and (3) Nong Hoy, near Varee School, and (4) Nana Jungle on Saturday mornings only. Opening times: 07:00 - 17:30, except Nana Jungle with is Saturdays only from 07:30 till everything's gone a couple of hours later. Rustic & Blue is the famous fancy-but-homely breakfast place in Chiang Mai. Located in the fashionable Nimman area (of course! ), Rustic & Blue serves creative, tasty, fresh, homemade dishes that look absolutely perfect. Rustic & Blue has to be the most Instagrammed cafe in Chiang Mai, and you'll see why as soon as you step inside: sunlight cascading through big open windows, a gorgeous garden decorated with white dream catchers and sometimes teepees, slightly worn wooden tables - some of them painted a gorgeous shade of turqoise, exposed Edison bulbs, wooden boards, and precisely chopped fruit meticulously arranged in their amazing accai berry or berry banana smoothie bowls. There's a beautiful garden area with chairs, tables, and hammocks. Recommended dishes: Brekky stack, smoothie bowl, beef tacos, lavender and honey ice cream. Location: On Nimman Soi 7, here. Food4Thought 'hand craft' healthy, creative Western food from scratch and serve outstanding home brewed coffee in a breezy open space decorated with ferns, trees, grass, fairy lights and flowers. Their goal is for customers to feel confident they're eating safe, healthy food, and they source everything local and organic where possible. I meant it when I said the coffee is outstanding. You can choose to have your single-origin coffee beans served in a French press, drip, aeropress, or more, and the coffee beans are hand-ground for each and every cup. Recommended dishes: Curry Chicken salad, The Harvest salad, Breakfast Smoothie, egg and bacon waffle. Location: Just off Huay Kaew Road and close to Nimman, here. In a quiet leafy residential area off a busy main road, Bake & Bite is a real treat. The coffee is strong and cheap, the portions are incredibly generous, and there's no WiFi to distract you from enjoying some of Chiang Mai's best breakfast and brunch food. The decor feels like a quaint American diner mixed with your grandmother's house, and it has pleasant outdoor seating (ask for complimentary mosquito spray if mozzies are on the prowl). It's moved around a lot in the past, but don't be fooled by any 'business closed' search results - this restaurant IS open in the location provided below. Whether you're after a healthy breakfast like an avocado sandwich or absolutely decadent deliciousness like the French toast with candied bacon, pecans, and maple syrup, there's a large menu offering something to suit every taste. They bake their own bread and cakes, and yummm, their cakes are good. I love sitting in the pretty garden area with a cake, coffee, and my book. Bake & Bite is a little hidden away, but worth seeking out. Especially for that bacon French toast. I haven't seen that anywhere before! Recommended dishes: French toast with candied bacon and pecans, hot Americano coffee, a treat from the fridge full of baked goods. Location: Near the river and McCormick Hosptial, here. Opening times: 06:30 - 16:00. Closed Fridays. Angel's Secret is a mellow, pretty, very colourful restaurant with a chill vibe and hearty, wholesome food. They have a real fixation on breakfast and getting the little details right. Apple, almond, and cinanamon oatmeal, colourful tropical fruit bowls, egg sandwiches, French toast, Nutella and dragonfruit crepes, croissants. The staff are sweet, friendly people, so you'll feel welcome and comfortable whenever you go. They also serve all your tasty Thai favourites if you're feeling more lunchy than breakfasty. Recommended dishes: Carrot cake with zesty lemon frosting, tropical fruit bowl, fluffy omlette, The Zinger juice. Opening times: 07:00 - ??. Closed Mondays. Ok, ok, this isn't a PLACE in Chiang Mai, but what list of great breakfast in Chiang Mai would be complete without this Thai breakfast staple? Meat eaters have just gotta try it while you're here. In the morning, it's best to follow your nose. You'll smell the BBQing pork sticks in the air, and probably see a queue of hungry Thai people crowding around a street stall. Small sticks cost between 3 to 5 baht each, and big sticks costs 10 baht. The pork is fattier than what we're used to as Westerners, but it's that way on purpose. Trust me, it goes so well with the sticky rice that after a few bites you'll be hooked. A bag of sticky rice for one costs 5 baht, making this the cheapest breakfast option in Chiang Mai by far. It's also an amazing midnight snack. There are a few other pretty good options like Smoothie Blues to try. Did I miss your favourite off? Why do you love it? Tell me so I can go eat breakfast at 1p.m. there! You missed Breakfast World. A theme park for the mouth. The menu itself makes me go "Wow"
And I enjoy a good Blue Diamond breakfast now and again. Great Koi Pond there.